Protesters wearing Guy Fawkes masks have descended on Trafalgar Square for a march in support of the hacking collective Anonymous. The Anonymous Million Mask March in London was buoyed by the presence of Russell Brand, who donned a mask and joined protesters. Anonymous protesters chanted "scum" at police officers tonight as they were told to move during protests in central London. One Anonymous protester told of how he was moved to join the group after being arrested under the Computer Misuse Act, despite having "done nothing wrong". Sean Roesner, 21, a self-employed computer programmer, travelled to tonight's protest with his brother and friend from King's Lynn, Norfolk this afternoon. He said: "We turned up and the protest was at Buckingham Palace. When we arrived people were firing fireworks at the Palace. "It was funny. I didn't have any but I would have fired some if I had. "I joined Anonymous because I was arrested under the Computer Misuse Act. I spent eight months on police bail last year and had done nothing wrong. "We are here to stand up for what we believe in, to make the world a better place." Mr Roesner said his friend had been among a group of people encircled by the police on The Mall and was waiting for him to be released so they could return home. Fireworks have been fired at Buckingham Palace during a protest against austerity. Protesters have gathered at the Queen Victoria Memorial after protesting outside parliament. 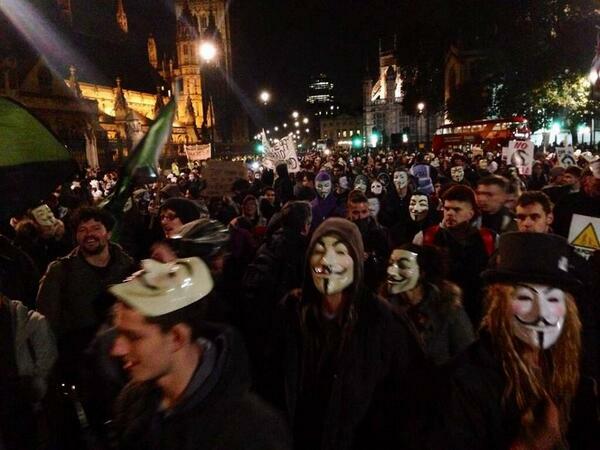 Police have stopped demonstrators taking part in the Million Mask March from reaching Buckingham Palace. Supporters of the online activist group have clashed with police after they were forcibly ejected from a McDonalds in Central London. Supporters of the online protest group Anonymous have taken part in a series of demonstrations to coincide with Bonfire Night. The group has taken for its logo the image of Guy Fawkes made famous by the film V for Vendetta. In the film and the graphic novel it's based on, V overthrows a corrupt government by blowing up the Houses of Parliament. Demonstrators in Madrid tried to march on the country's parliament but were stopped by police. In London, protesters clashed with police in Parliament Square. In Washington, demonstrators peacefully protested outside the US Justice Department. Protesters taking part in the Million Mask March have spread from Trafalgar Square towards Westminster as well as down the Mall towards Buckingham Palace.